Kentucky Native Marsha Norman’s writing earned this show a Tony Award for “Best Book of a Musical” and Drama Desk awards for “Outstanding Book of a Musical” and “Outstanding Musical and Outstanding Lyrics”. The play is about to enjoy a revival on Broadway, but central Kentucky audiences can enjoy it in Gifford Theatre on the campus of EKU. The classic story of The Secret Garden, by Frances Hodgson Burnett has delighted each new generation since its publication in 1911. The Secret Garden tells the story of orphaned 11 year old Mary Lennox. When she is sent from India to live with her Uncle and his son, she longs for a home and belonging. The estate's many wonders include a magic garden which beckons the children with haunting melodies and the "Dreamers", spirits from Mary's past who guide her through her new life. The The Secret Garden is a compelling tale of forgiveness and renewal. 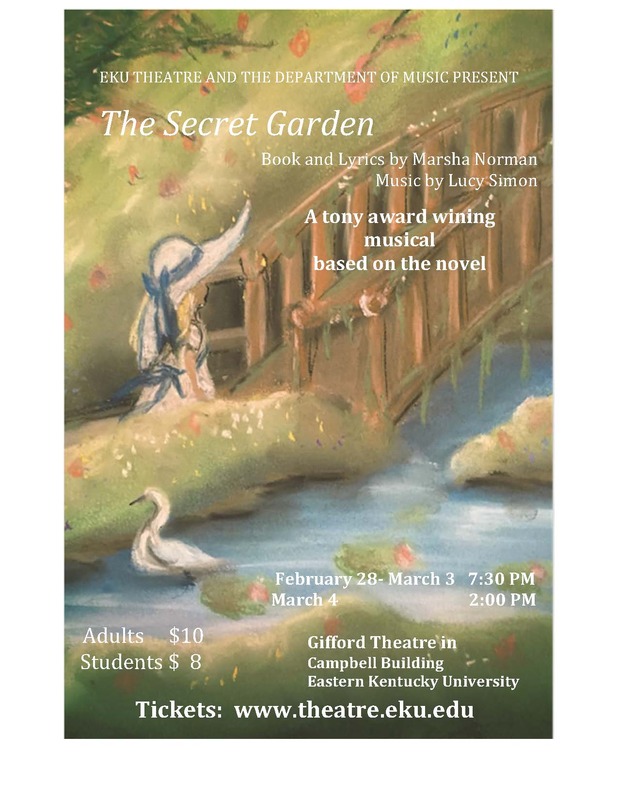 This production of Secret Garden is a unique collaboration, bringing together professional guest artists, Richmond area community members, and faculty and students from EKU’s Music and Theatre programs. Helming the Musical Direction of the piece is Madison Central High School’s Lisa Jury, and several Madison County High school and Middle School students are featured. We are excited to showcase their work in Gifford Theatre at 7:30 PM, February 28-March 3, and at 2:00 PM March 4. Please note the earlier start time for evening performances. In conjunction with the show, EKU Theatre will offer an afternoon of Theatre and Acting workshops for High School students on Saturday March 3. The event includes workshops, pizza dinner, an opportunity to meet the audience, and tickets to the performance. Students may attend with a school, or on their own. Reservations for this event are handled directly through the Theatre Office at 859-622-1315. Online ticket sales for the performance are now open and can be accessed through www.theatre.eku.edu. The box office at Gifford Theatre opens one hour before performances, ans 12-4 weekdays. Tickets are $8 for students and $10 for General Admission.